A Thousand Splendid Suns is without a doubt one of the most difficult reads I have ever, well, read. From the beginning, Khaled Hosseini portrays the worst about life in twentieth-century Afghanistan. Sparing no pity for his protagonists, he takes Mariam and Laila—future sisters-in-law (or whatever it's called when two women are married to the same man)—through psychological and physical hell, often at the whims of the domineering and insensitive males in their lives. The book calls to mind the movie The Pursuit of Happyness, due to the seemingly endless series of emotionally draining tragedies that befall the characters. What sets the book apart, though, is its cultural setting. 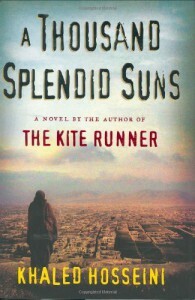 Hosseini's portrayal of the male-dominated, conservative Islamic society in which the story takes place not only educates the reader on the religious and social climate of that region, but also leaves room for events whose extremity would seem inaccurate and exaggerated in an American setting. While I wouldn't consider Hosseini's writing style to be particularly refined, I would submit that the story stands for itself. It is only difficult to get through because of the deep level of emotional engagement it requires of its readers. And through the voice of the story's narrative, Hosseini professes a faith in, and love for, humanity; a quality which appears to be characteristic of him as an author. A Thousand Splendid Suns will challenge you to match this untiring faith. Read it!